CBS News:– Tropical Storm Isaac formed in the Atlantic Ocean on Saturday, the National Hurricane Center said. 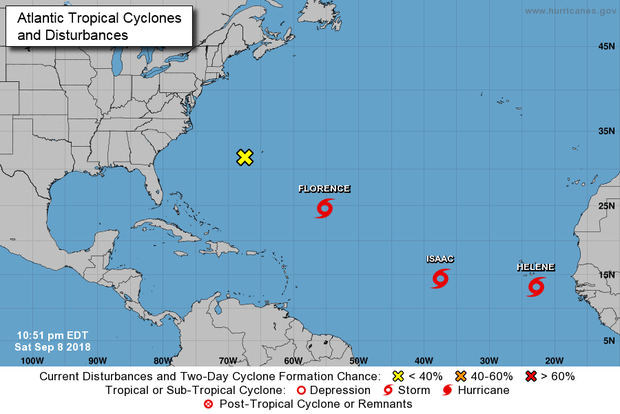 It’s one of three storms churning in the Atlantic Ocean, with Tropical Storm Florence heading toward the U.S. East Coast and Tropical Storm Helene heading toward some of the Cabo Verde islands. Hurricane season reaches its peak on Sept. 10-11. Helene, which formed Friday night, is expected to bring tropical storm conditions to the Cabo Verde islands, off the coast of Africa, on Sunday. As of 11 p.m. ET Saturday, Helene was located 155 miles southeast of the southern most Cabo Verde islands. Helene could dump two to four inches of rain on the Cabo Verde islands, with up to six inches in isolated spots, through Sunday. Flash floods are possible. Florence is still moving slowly, and could become a hurricane soon, the National Weather Center said. As of 11 p.m. Saturday, Florence had maximum sustained winds of 70 mp and was located about 790 miles southeast of Bermuda. The storm is expected to head toward the U.S. East Coast, although its exact path is still unclear. Both North and South Carolina have declared states of emergency in preparation. Caribbean people take warning, don’t take things for granted, be prepared!